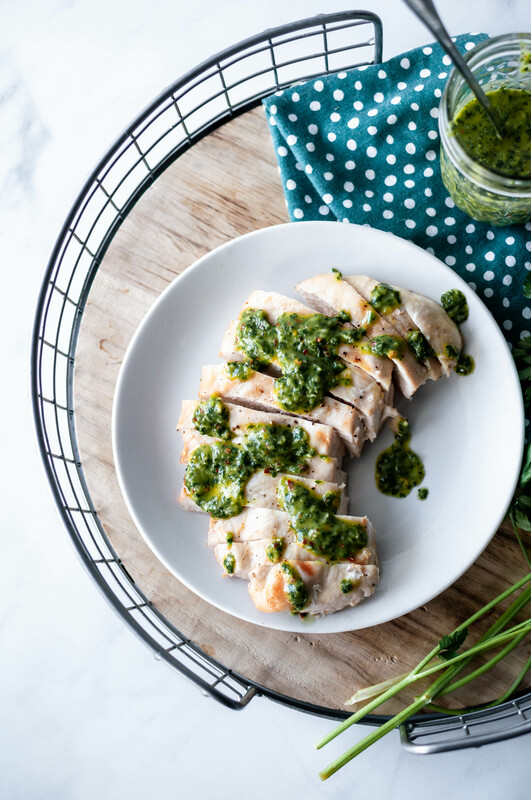 Grilled Chimichurri Chicken is the perfect summertime meal. Light and healthy, bright, fresh and super flavorful. You will want to smother this chimichurri sauce on everything. It’s summertime and as per usual, I want to grill everything. We bought a new grill a few weeks ago so I’ve been using every excuse to fire it up as often as possible. I love how easy it is to eat healthfully during the summer. Buuut… You know how sometimes healthy food can taste super bland and boring? I mean, you can only eat a plain piece of chicken so many times, right?! That’s where this Grilled Chimichurri Chicken comes into play. I like grilled chicken but I love it when it’s spiced up and flavorful and has a delicious sauce. Usually sauce means all that healthy eating goes down the drain. This chimichurri sauce is so bright and fresh tasting thanks to tons of cilantro and parsley. It’s a little zippy from the red wine vinegar and has a little kick of spice thanks to the addition of red pepper flakes. Those combinations of flavors, fresh, tangy, spicy create magic in a food processor. The sauce can be made ahead of time and actually tastes better after a few hours so the flavors can mingle. That makes this already simple and quick meal even easier. Combine cilantro, parsley, garlic, red pepper flakes, kosher salt, pepper and red wine vinegar together in a food processor. Pulse several times to get the herbs in smaller pieces. Turn on food processor and slowly drizzle in the olive oil. Once desired consistency is reached turn off. Store in an airtight container in the refrigerator. Preheat grill to medium-high heat (around 400 degrees). Season chicken with salt and pepper. Grill chicken, 2 to 3 minutes per side. Remove from grill and allow to rest for 3 to 5 minutes. Slice chicken and top with desired amount of chimichurri sauce.